Seraka Dance Company proudly presents an evening of non-traditional bellydance solos and duets, blending classical styles with modern fusion for a unique experience of dance. Seating is extremely limited. It is strongly suggested to purchase your tickets in advance to avoid disappointment. 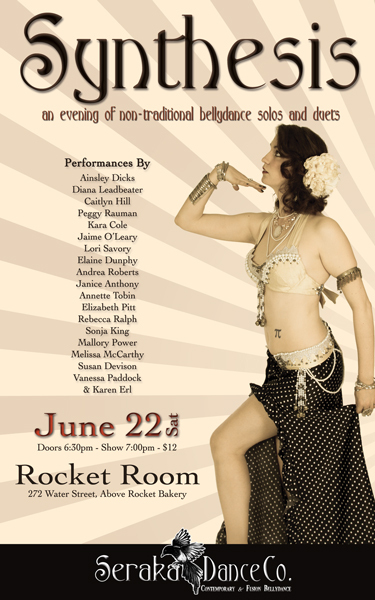 Tickets available for $12 from Seraka Dance Company by emailing Susan at info@seraka.com to arrange a pick-up time. “We wanted to create a new atmosphere for the dancers in the local community, a chance to show family and friends and dance supporters what each dancer enjoys about bellydance, what she’s working on, or what she wants to express creatively. We see lots of opportunities for dancers to perform in groups, or with performance companies, but rarely do we get a chance to see a dancer perform a solo piece that is uniquely her own; a piece that is not catered to fit a theme of a show, or to fill a request from a client, a piece where she can be seen as an individual and not as a member of Troupe-X. This is why we’re nixing the mention of affiliations, and allowing dancers from any troupe, school, or group to present a piece under her own name, as her own individual artist. Vanessa Paddock, Artistic Director of Seraka Dance Co.